Ultimate Star Jennylyn Mercado bags another huge endorsement. This time, with an international cosmetics brand Max Factor Philippines. Jennylyn expressed how grateful she is to be part of the Max Factor Philippines family through an Instagram post she shared, Friday afternoon. Meanwhile, Max Factor Philippines is happy and proud to welcome Jennylyn whom they described as an image of today's empowered Filipina. Beautiful inside and out. She is the image of today’s empowered Filipina, beautiful inside and out. Kapuso couple, Dennis Trillo and Jennylyn Mercado are known to be travel enthusiasts. Whenever they are given the chance from their busy schedules, the Kapuso couple enjoys exploring different places whether it be locally or internationally. 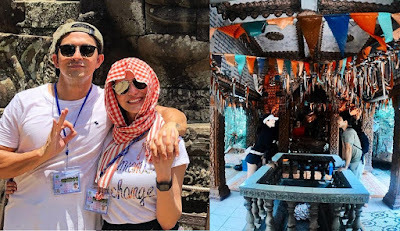 Just recently, Dennis and Jennylyn were spotted temple hopping in Cambodia. Check out some of their photos during this short yet adventurous trip of theirs.